Database Publishing® was already significantly invented and developed by VIVA (or VIVA employees) at the end of the 1980’s. One of the first products with a Database Publishing interface was the typesetting and layout program “LinoPage” (1989-1991) and later “VivaPress” (1992-1994), “VivaPress Professional” (1994-2005) and with effect from 2005 “VivaDesigner” and “VivaNWP Designer”. “Database Publishing®” is a technology for linking a layout program to a data source. Graphic documents can be created automatically using Database Publishing based on this connection. Instead of creating content such as text or images manually and placing them on a page, the content of a database is placed on the page using a set of rules. These rules define which content is placed in which position on the page or which typographic attributes or formatting a text should have. What technical solutions are there for “Database Publishing”? The manual (classical) automatic creation of documents with a desktop application, which is driven by graphic designer/expert. Manual means in this case that the graphic designer/expert must start the creation manually. a) content (text, images) is placed on a page in existing elements and may be assigned with attributes and collated automatically. b) predefined elements and combinations of elements are placed on a page. This technology can be used to place ready-made page sections that could not be produced automatically on a page. Fully automatic creation of documents based on a template and a data source, bnut based on a server application. 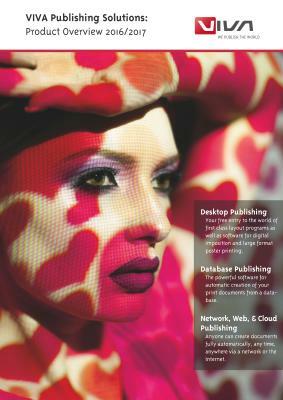 With Viva products you can of course apply all the “Database Publishing” solutions and technologies described. What legal aspects are there for “Database Publishing”? The term “Database Publishing®” is a registered trademark of Viva GmbH and not a general term as is sometimes erroneously assumed. If you use the term “Database Publishing” (e.g. in brochures, on Web pages, in advertising, etc.) you must add a footnote containing the following trademark information: “Database Publishing®” is a registered trademark of Viva GmbH. On Websites you must include a link to our Website (“http://www.Viva.us”). You can create and edit documents in the same quality on the desktop or in the web. You can create and edit documents manually (“Creative Process”) or with individual limitations (“Limited Creative Process”). You can create and edit documents manually in a team (“Creative Team Process”) or with individual limitations (“Limited Team Process”). You can create and edit documents manually using a database (“Database Publishing” Process by Drag & Drop) or with individual limitations (“Limited Database Publishing” Process by Drag & Drop). You can create and edit documents semi-automatically using a database (“Database Publishing” Process with “creative” or “intelligent” forms). You can create documents fully automatically using a database or forms. You can edit all documents that were created semi-automatically or fully automatically, with or without limitations. With ALL processes/workflows, you can edit the documents created with Viva in third-party programs (e.g. Adobe® InDesign®). Thus completely new possibilities arise for the structuring of processes/workflows for the creation, editing and management of documents. In all cases, Viva documents can be saved as PDF, JPG, XML or IDML files for InDesign®. In the creative process, a user has all the functionalities of a professional typesetting and layout program, irrelevant of whether he uses the program on the desktop or in the Web. With this process, the user constructs the document completely on his own, uses existing Viva documents or imports templates from third party programs (e.g. Adobe® InDesign®). As an additional option, you can edit the documents created with Viva in third party programs (e.g. Adobe® InDesign®). This process is suitable for the manual production of all print documents for which no automation is necessary. In the limited creative process, a user has reduced editing functions, irrelevant of whether he uses the program on the desktop or in the Web. This process is useful if users should only edit certain parts of a document. In this process, a user can for example only edit the image crop, edit text and only assign predefined style sheets. The limitations can be defined individually for each document, and in the Web Edition they can also be assigned to specific roles. The creation of a suitable template takes just a few minutes. This process is suitable for the manual editing of documents where the Corporate Design must be adhered to and when the users don’t want to learn any new software. In the creative “team” process, many users can work simultaneously on “one” document on the desktop or in the Web, without a special database or management software being necessary. For this purpose, appropriate tasks are created, whereby each task is represented by a separate file. a task file contains all the objects that a user must edit. He can however also insert his own objects. This process is suitable for the production of complex documents like magazines, newspapers or business reports. With the limited “team” process, the editing functions are reduced in the same way as with the limited creative process. With the Database Publishing Process by Drag & Drop (“Easy Publishing”, “EP” for short), a document is linked to a data source (database, CSV file, etc.). On the basis of this data source and predefined layout rules, the user can create documents semi-automatically on the desktop or in the Web by Drag & Drop. A layout rule consists of a series of instructions as to how for example images and text should be displayed or formatted. Here the user drags the content from the data source to the required text or image objects in the document to which a layout rules has been assigned. The images and text are displayed automatically according to the layout rules. The user can also add his own content that is not part of the data source. This process is suitable for semi-automatic production of very individual catalogs based on a database, whereby the layout of the data may be freely chosen by the user. With the limited Database Publishing Process by Drag & Drop, the editing functions are reduced in the same way as with the limited creative process. In this case, the user can for example only drag the database content to existing objects and not add his own content. With the Database Publishing Process with “creative” forms (“Creative Publishing”, “CP” for short), a graphic template is created on a special page. These pages are called “Forms”, the document is called a “Template”. For setting up the template and the forms, the user has all the functions of a layout and typesetting program at his disposal. Forms can also be combined with master pages as backgrounds. The master pages may be assigned either manually or by using a rule. Picture objects are linked to the database via appropriate settings. In the text objects, variables for database fields are inserted. The user can test the data source with the form on the desktop. Here the content from the database is linked automatically to the objects in the forms. an extensive set of rules enables the manipulation of data. In this way, content may be adapted based on the rules or typographic decisions may be taken as to how the content should be displayed, depending on certain parameters. The templates created can also be linked with content from a database fully automatically by using a server process. Since templates with creative forms generally have no clear layout rules, this process is suitable for semi-automatic and fully automatic production of very individual catalogs on the basis of a database, which also defines the order of the data. With the Database Publishing Process with “intelligent” forms (“Intelligent Publishing”, “IP” for short), a schematic template is created on a special page. These pages are also called “Forms”, the document is called a “Template”. While in the process with creative forms the objects have fixed positions, objects in the process with intelligent forms may be positioned dynamically. This means that the position of an object may change in connection with another object. If for example an image and text share the same area, an image must become larger or smaller if the amount of text becomes smaller or larger. Intelligent forms can consist of a whole page or also part of a page (e.g. 1/2, 1/4 page, etc. In this case, pages my be built dynamically with several different forms and combined in any way. As well as text and picture objects, complex tables, charts/graphs and bar codes can be created dynamically. Since templates with schematic forms have very clear layout rules, this process is suitable for semi-automatic and fully automatic production of price lists or catalogs on the basis of a database. In every Viva document, you can store manual or automated XML data in XMP format, which can be imported or analysed from another desktop or Web application. This technology is frequently used to apply individual and freely definable Meta data to documents. This can for example be Meta data for further editing such as information about the paper type to be used, the binding type or a pricing structure. With a Viva template with creative and/or schematic forms, the XML data may for example define a form that is analysed and displayed by a Web application. In this way a Viva template with creative and/or schematic forms may be created not only on the basis of a separate data source, but also for individual entry. This process is particularly suited for automated production of business cards, invitations and other printed matter that are not produced from a database.